Nuriad describes the application of precision-delivery coated butyrate to control Campylobacter in two experiments in broilers. 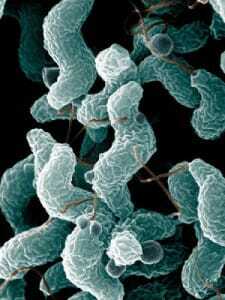 Campylobacter (Figure 1) is the leading cause of foodborne illness in the US and in Europe. Epidemiological studies indicate that poultry and poultry products are significant sources of human infection. In this context, Campylobacter colonisation in the intestinal tract of broilers is an important parameter to consider, as intestinal Campylobacter count is correlated with broiler carcass contamination. Since it has been estimated that a reduction of intestinal Campylobacter counts of 2 Log10 would result in a 30-fold decrease of human campylobacteriosis cases, and given that certain butyrate-based feed additives have already been described to decrease colonisation of certain zoonotic pathogens in broilers, the authors of this paper decided to explore the effect of a target release coated butyrate, able to deliver butyrate in the distal parts of the gastrointestinal tract (ADIMIX®Precision), on Campylobacter counts in broiler caeca. To this end, they set up two different experiments. In a first study (Figure 2), natural Campylobacter infection was mimicked. Three broilers groups were raised in separate isolators; one group received 3kg coated butyrate product per ton finished feed, a second group 5kg per tonne, while the third group served as a negative control. Microbiological analysis of cloacal swabs demonstrated that the birds of all three groups were Campylobacter-negative at day 10, while they were positive for Campylobacter jejuni at day 18 (between 5.12 and 5.77 Log10 CFU per gram caecal content), without artificial infection. While caecal Campylobacter count remained high in the negative control group, counts for the groups receiving butyrate were found to be below the detection limit of 2 Log10 at day 29 (for the 5kg per tonne group) and at day 39 (for both butyrate groups). 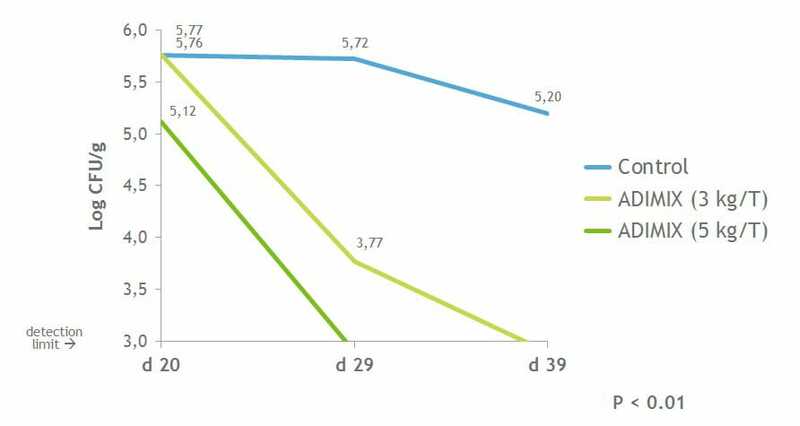 In a second trial (Figure 3), the effect of supplementing coated butyrate during different feeding phases (starter-grower-finisher) was evaluated after broilers were orally infected with a Campylobacter jejuni on day 18. 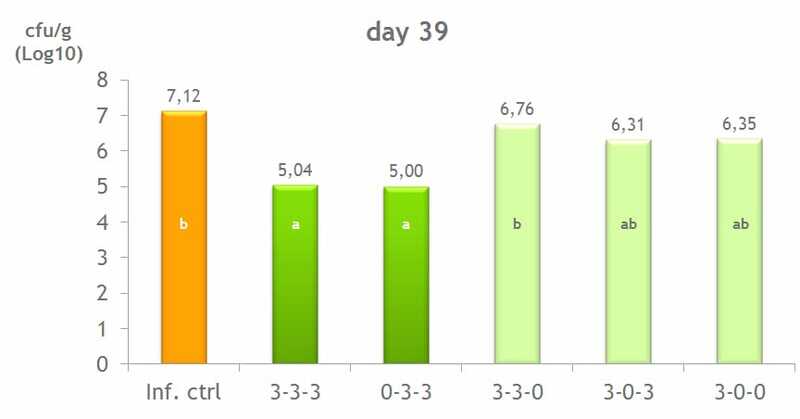 From the results it can be concluded that in this experimental setup, 3kg per tonne of butyrate product was able to reduce caecal Campylobacter by minimum 2 Log10 units by day 39, when included in the feed from the moment of infection onwards. Apart from its well-documented trial on zootechnical performance, the tested butyrate product can therefore prove to be a valuable approach to reduce the number of human campylobacteriosis cases, by significantly limiting Campylobacter colonisation in broilers. The authors of this paper were Tim Goossens1, Maja Marien1, Alessandra De Cesare2 and Gerardo Manfreda2. 2Department of Agricultural and Food Science, University of Bologna, Italy.